How To Become A Prepper – Without Even Trying! How To Become A Prepper —- Without Even Trying! If the title puzzles you, it’s because, as a homesteader, you’re already prepped for various emergencies and may not even know it. You already make your own food, harvest rainwater, raise animals, maybe even have a generator or a few solar panels. Unlike most people , you’ll be able to put food on the table even when something bad happens like an economic collapse or a prolonged grid-down situation. Now, I’m not saying you need to prep for Doomsday or some other far-fetched scenario. Quite the opposite. In this article, I want to reveal to you some of the scenarios that are actually likely to affect you, your family and your homestead, as well as give you basics survival advice. Like I said, you’re probably doing some of these things because you’re a homesteader, but I’m sure many others are not on your to-do list, in which case I’m glad I helped you uncover these holes in your emergency preparedness plans. I’m sure you probably have some sort back-up if the lights go out for a few hours, maybe some food set aside… but what if next time it’ll last a week? You’ll need much more than flashlights, but have no fear because the things you need are not only easy to procure but also cheap. Blackouts aren’t just about the lights going out. You need to consider all the things that can happen. For example, what if one occurs during the winter, when there’s snow and freezing temperatures and you can’t leave the house for a couple of weeks? Things like extra food (tuna cans, beans, rice, peanut butter, honey), water, flashlights, an emergency radio – these aren’t just things you see on boring emergency lists; they are things you need. Our Recommendations: Get What You Need here! Literally any kind of emergency could mean you run out of water. You’ll need it for much more than drinking: consider you have to wash clothes, do the dishes, take care of personal hygiene, water your garden and so on. Now, I’m not trying to be overly negative and suggest that your water could get contaminated (though I do read regular news of rivers getting contaminated), but consider the more likely scenario of when your faucets stop working. Though, as a homesteader, you’re probably much better of hunkering down in case of a disaster, you always have to consider the possibility of you being thrown away out of your home. A huge flood, a major hurricane, a wildfire, in cases like these you have no chance of staying inside your home; you just have to go. Bugging out, or evacuating in plain terms, is not hard, but it does take some planning. First, you need a vehicle such as a car or an RV that you’ll use to make your escape. It needs to be properly equipped for all seasons, including food, water, blankets and flashlights (in case you remain stranded somewhere on the side of the road). Next, you need to know all the possible ways to get out. With disaster on your tail, you may have minutes to evacuate, and you can’t afford getting stuck in a traffic jam or hitting a dead end. Every second will count. Speaking of vehicles, you need to make arrangements to take as many things with you as possible. A large trunk will help, maybe even a trailer or a rooftop cargo carrier. Then, we have the preppers all-time favorite, the bug out bag. We like to spend time tweaking it, making it lighter, smaller and, of course, to add more things to it. My list of over 150 bug out bag items will help, just make sure you stay away from cheap items that might break or not work at all when you need them. Last but not least, you’d need a place to evacuate to. Even if you don’t have one, you should still prepare to bug out. Better to sleep in your car than die in your home, but really, any place that can keep you safe can be considered a “bug out location”: a friend’s house, a piece of land that belongs to a relative etc. You need to secure your home, your family and yourself. I’m just pointing out the obvious here, but having a few guns, an alarm system, a couple of security cameras and some motion sensors will go a long way towards protecting your home, your garden and your livestock. But you also have to consider your personal security. A concealed carry handgun is probably your best option, but there are others if you don’t like guns, things like pepper spray, stun guns and other alternative weapons. I’m sure you probably have enough food to last you 1 – 2 weeks, but what if the next disaster will keep you inside for longer? A 1 month stockpile should be anyone’s goal, maybe even longer if you have the space to keep it all. Focus on the staples (rice, beans, honey etc.) but make sure you only get food you usually eat, and stay away from MREs and other survival foods. Most aren’t worth it. Beekeeping, we discovered, has quite a learning curve. We would spend months adapting to our newfound hobby. Sometimes we would be successful. Other times, not so much. 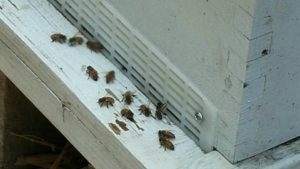 After we finally had our hive in the proper place, we spent quite a bit of time watching bees do what they do best. We placed our hive on top of cinder blocks to give the hive some ventilation and keep ants and other bugs out of the hive. It’s no surprise that honey is a huge attraction for ants. What was a surprise were the frogs that suddenly appeared looking for lunch or dinner. We had to install some metal screening below the hive to keep them from sitting there feasting on our returning worker bees. Our beekeeping “mentor” encouraged us to take a look in the hive now and then. Every few weeks or so we would “suit up” and take a look inside the box. We learned that going into the hive too often would disrupt the bees more than help them. Bees are capable of taking care of their own and removing anything that’s not supposed to be there. This includes any bees that die in the hive. We watched many dead bees being carried away from the hive by those who were still living. After a few weeks we began to notice fewer bees were around the hive. When we opened the hive, we discovered a lot fewer bees. They were also behaving differently. In the past the bees would buzz around us like crazy when we opened the hive. This time they clung to the bee suit like a blanket and all huddled together. We called our beekeeper friend for advice and learned that our bees had swarmed. The bees swarm — leave the colony — when the queen dies or leaves the colony herself. Without a queen, the hive cannot survive. The drones and worker bees either follow the queen or die. Our beekeeper friend didn’t want to see us give up, though. 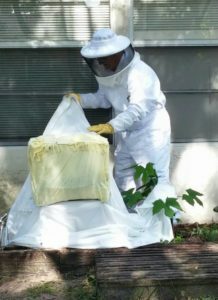 He took our hive box and said he would get us a new colony the next time he did a removal. It wasn’t long before he found another colony from a local bee rescue. This new colony also had a queen included. It wasn’t long before we found this new colony had already lost its queen. Here we go again, forced to buy another queen from the beekeeper! We found that queens will cost you around $30.00. We went ahead and bought the new queen in hopes of getting the hive built back up. For several weeks we constantly watched our new colony of bees and our second attempt at beekeeping.Our first colony of bees were docile and very easy to work with. The second colony was a different story. These little bees were agressive ! It became very hard to work with them and we were constantly attacked in the back yard. 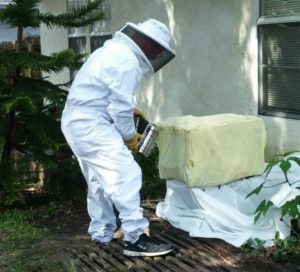 Luckily, we had the bee suit which helped but keep in mind you will get stung sooner or later. Even with the not so good temperament,we enjoyed watching them fly in and out of the hive, bringing pollen from nearby to build their hive and produce what we hoped would be raw honey! Then one day! We began to notice not many bees around. We immediately thought, oh no, Not again! It was time to look inside the hive again and check our frames. Inside we found very few bees and no queen. After some research and contacting our beekeeper we found a couple of the frames had what is called “wax moth infestation”. Wax moths are insects that only wreak havoc on the wax combs being built by our bees. If not caught quickly they can ruin your hive. This time it was a little too late since most of the bees had left. This time for good!! We cleaned the frames from the hive and removed all of the infected combs. Our hive is a ten frame hive and we found two and half that were infected. The rest were in good shape with a nice amount of raw honey to be harvested. We ended with a quart jar of raw honey! It was time for us to decide if we wanted to start over AGAIN or wait until we made our move to our property in Tennessee. The decision was easy that we would spend our time preparing for our upcoming move and try again once we were settled. In my next Post I will give you some ideas about buying equipment and the costs of beginning your beekeeping adventure. I hope to see you then.